Ur‐Energy is a uranium mining company operating the Lost Creek in‐situ recovery uranium facility in south‐central Wyoming. It has produced, packaged and shipped more than 2.4 million pounds from Lost Creek since the commencement of operations. 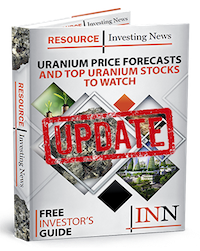 Ur‐Energy (TSX:URE,NYSEAmerican:URG) reports it has been advised that Global X Uranium Exchange Traded Fund, its largest shareholder, has completed a rebalancing of its fund in respect to its holdings in Ur-Energy. Because of changes incorporated in the underlying index used by Global X, to include larger companies in various nuclear fuel cycle industries, Global X has been systematically rebalancing holdings in all uranium mining and development companies, including Ur‑Energy. “We are glad to have been able to assist Global X in reaching their targeted rebalance figure. Whether intended or not, this type of trading activity can have a suppressive influence on a company’s shares. We are very pleased that any pressure has been removed with the orderly completion of the Global X rebalance with respect to Ur-Energy. Overall, we feel that our registry of shareholders has been strengthened through this process. We are pleased to have Global X continue on as one of our larger shareholders, and we look forward to working with them in the future,” said Jeffrey Klenda, Chair and CEO of Ur-Energy.